Mandolins have been gracing music since the 17th century and their popularity is a testament to their unique, crisp sound. With F-Style and A-Style bodies, we offer six mandolins, from the traditional pure acoustic to the acoustic-electric option, all in attractive classic finishes. 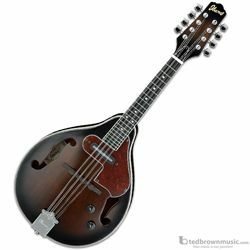 From Maple necks, Rosewood bridges and fretboards, and your choice of Solid or laminate Spruce tops, there's a mandolin for any melody you want to play.